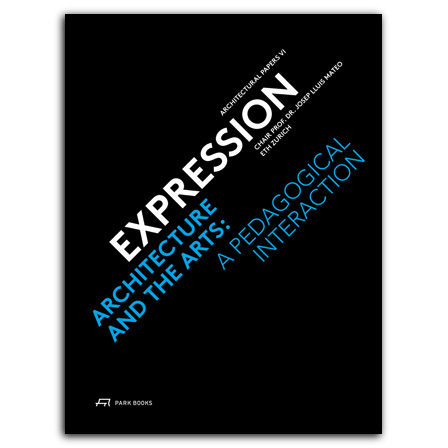 Expression is based on a three-term program at ETH Zürich investigating the topic “architecture and art”. Essays, interviews and students’ projects document and condense the findings of this topical research in the fields of art: film, literature and visual arts. Three concrete examples in Switzerland have been studied: a Giacometti museum in Stampa, a Cinémathèque in Locarno, and an Elias Canetti library in Zürich. The book shows the differing influence film, literature, and visual arts can have on architectural thought and design. It also reveals the knowledge to be gained from combining arts and architecture. The essays by Josep Lluís Mateo, Florian Sauter, Isabelle Concheiro, Ramias Steinemann, and Philip Ursprung, and the interviews with Gottfried Böhm (German architect and sculptor), José Luis Guerin (Spanish film director), and Pier Vittorio Aureli (Italian architect and theoretician) explore the importance of artistic impulse on architecture. co-founded Brussels-based studio Dogma with Martino Tattara in 2002. He currently teaches at the Architectural Association in London and is the Davenport Professor at Yale School of Architecture. He also directs the PhD program “The City as Project” at Rotterdam's Berlage Institute. graduated from the School of Architecture of Barcelona (ETSAB). She is a founding partner with prefix-re architects in Lausanne. , born 1949, runs his own studio mateoarquitectura in Barcelona and is a professor for architecture at the Swiss Federal Institute of Technology Zurich (ETH Zurich). , born 1963, read art history, history, and German literature and linguistics at the universitries of Geneva, Vienna and Berlin. He has been a professor of modern and contemporary art at University of Zürich 2005–11 and a professor of histroy of art and architecture at ETH Zurich since 2011.